Game 10 - Steel at Rattlers, 6.11.16, 6 p.m.
What: Fresh off their first win of the season, the Steel face the Rattlers in Arizona. When: Saturday, June 11 at 6 p.m. (PT). Where: Talking Stick Resort Arena; Phoenix, Arizona. Regional Media: Radio - 750 The Game (AM). National Media: Stream - ESPN3/WatchESPN. This season: April 1 - Rattlers 80, Steel 28. April 30 - Rattlers 68, Steel 21. Series History: Regular Season - Rattlers lead 8-0 (4-0 at home). Playoffs - Rattlers lead 1-0 (1-0 at home).. Note: The Rattlers have outscored the Steel 148-49 in two games this season. Forum: To comment, please login or register. The Steel are 1-8 overall, 0-7 on the road and 0-5 in conference play. They are coming off a 68-35 home win over the Tampa Bay Storm on June 3. They are averaging 38.9 points per game and are allowing 60.7 points per game. The Rattlers are 7-3 overall, 3-0 at home and 5-0 in conference play. They are coming off a 77-62 road win over the Cleveland Gladiators on June 3. They are averaging 64.9 points per game and are allowing 47.3 points per game. First Downs per game - Steel 18.4; Rattlers 21.7. Yards per Game - Steel 256.0; Rattlers 300.2. 3rd Down Conversion - Steel 42%; Rattlers 58%. 4th Down Conversion - Steel 39%; Rattlers 45%. Total Tackles - Steel 186.5; Rattlers 275. 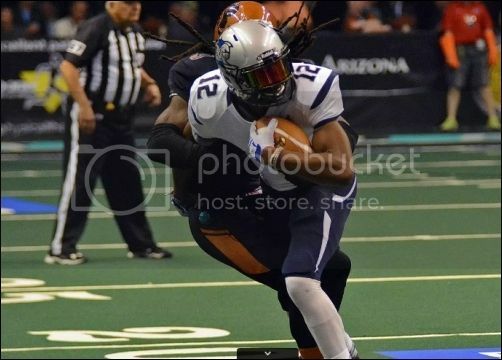 Tackles for Loss - Steel 13; Rattlers 25. Total Sacks - Steel 10; Rattlers 20. Fum Rec - Steel 9, Rattlers 9. Interceptions - Steel 5, Rattlers 10. Had Intercepted - Steel 20, Rattlers 5. Note that the Steel have played nine games, while the Rattlers have played 10. Note: Roster information is subject to change and is presented here as a basic guide for following the game. Roster information is gathered from the AFL's official website, which is not updated on a consistent basis. Updates will be provided here as soon as they become available. Portland finally ended their winless streak to open the season with an impressive win over a team they were supposed to beat. The Steel committed two (accepted) penalties and were able to break out to a large lead, then hold on for the 68-35 win. It was the largest margin of victory in franchise history, and the first win in four games of the Shane Austin era. Shane Austin engineered a series of drives with short passes for the most part. Ironically, they were on the short end of time of possession by nearly three minutes. Austin threw for 5 touchdowns and ran for another two. It was the first game of the season he did not toss an interception. On the season, Austin has completed 60.5 percent of his passes, and has passed for 19 touchdowns. Tom Gilson continues to be reliable at the receiver position. He has 89 catches for 819 yards and 10 touchdowns. Tyrone Goard, who leads the team in receiving touchdowns with 13, had caught 51 passes for 454 yards. Jared Perry returned after missing the past two games due to injury. Both of Perry's catches went for touchdowns, including a 34 yarder in the third quarter. He is second in receiving yardage on the season at 475. Jamar Howard, who was atop or near the top of every receiving category for Portland last season before going down to injury in the sixth game, is set to join the team for this game. Sergio Gilliam has been a monster in the defensive backfield, recording his second and third interceptions of the season against the Storm. Gilliam is second on the team in total tackles (25.5) and leads the team in interceptions. Mike McMillan had a quiet night against the Storm, but he has been solid all season and leads the team in total tackles. Defensive backs Arness Ikner and Christian Wise have been excellent additions to the defensive backfield, and have have had strong showings on special teams. The key to the win against the Storm was the pressure put on the quarterback by Robert Hayes, Brandon Sesay, Reggie Wilson and Dexter Davis. The quartet has combined for all 10 of the Steel's sacks this season. The Steel's defense forced 7 turnovers in the win, converting them into 40 points. The Steel did two things which enabled them to dispatch the Storm. They limited their penalties and protected the ball. That will be tough to repeat against the Rattlers, but taking care of those two areas could keep them competitive in this game. Player to Watch: Tyrone Goard (WR). Wild Card: Robert Hayes (MLB). Arizona bolted out the gate with five straight wins to start the season, but have dropped three of its last five. They remain the favorites to clinch the number one seed in the National Conference,and play five of their last six at home. The schedule seems to have been set up to give them an opportunity to make a run for an ArenaBowl XXIX berth. The Rattlers are loaded heavily with veterans, something which causes difficulties for younger teams. Nick Davila is one such veteran. Considered arguably the best in the business among AFL quarterbacks, he leads the league in passing yards with 2,709 and 68 touchdown passes. He is completing nearly 68 percent of his passes. Rod Windsor is second in the league in receiving yards per game at 118.1 per game. He is a thread to score on any and every play. Maurice Purify and Chase Deadder are complimentary pieces who can do damage all on their own. Purify has 40 catches for 489 yards and 17 touchdowns, while Deadder has 32 grabs for 430 yards and 10 scores. Anthony Amos does double duty as the fourth receiver and the team's kick returner. Mykel Benson is one of the leagues best at fullback and has 12 touchdowns on the ground this season. The defense is typically strong, though backs Arkeith Brown and Allen Chapman have been put on injured reserve. Al Phillips leads active players with 24.5 tackles and fellow defensive back K.J. Morton has 19.5. The Steel's protection of Austin will be tested by the likes of Dimetrious Tyson, Damian Borel and Tyre Glasper, who have combined to sack opposing quarterbacks 14 times on the season. The key for the Rattlers will be to avoid looking past the Steel. Two weeks ago, they fell to the Tampa Bay Storm by a 63-56 margin. The Steel defeated Tampa Bay by 33 last week. Injuries in the defensive backfield could hurt the Rattlers in this one. It will be up to the defensive line to force Austin into making some bad decisions. This could end up becoming a shootout, which would tend to play into the Rattlers' hands. Player to Watch: Nick Davila. Wild Card: Rod Windsor (WR). "(The players) understand if they play good football and if they play smart football, they can be the recipients of some blowouts. We have been having that issue against us as far as a number of weeks early in the season, so we're starting to turn the tide. But, we're only as good as our last game, so we're going to have to put another one together quickly." "This will be our second trip to Arizona and they're a very good football team, so we'll focus up (this week) The players will get a couple days rest and they are going to need that to be able to charge their batteries." "It's been a rough first half of the season and we know what we're capable of doing; in for myself, I want to give my all, and we came out there and showed that defensively, offensively and special teams. We just showed that." "This might be the toughest season. You know, we started out rough, but we have a great team and we know what we're capable of. It's a long season in the second half (of the season). For myself, being a vet, I try to lead as an example on and off the field, and I also learn from them. I think we're starting to put the pieces together, but we've got to say 'home.' We're 1-0 for tonight and tomorrow, but we'll work this week. It's a tough road going to 'A-Z' and hopefully we can take care of business." "Up front, we know what we've got. Hands down, I think we've got a talented bunch up front. They can get movement around anywhere and this group; they never quit. Everybody doesn't see it in practice, but they see it on the field." Going into their April 30 game against the Rattlers, the Steel had forced just two turnovers on the season; both fumble recoveries. since then, they have 12 in their past five games. The following is a chronicle of the team's forced turnovers (by the defense) over the course of the season. Interceptions - none. Fumble recoveries - none. 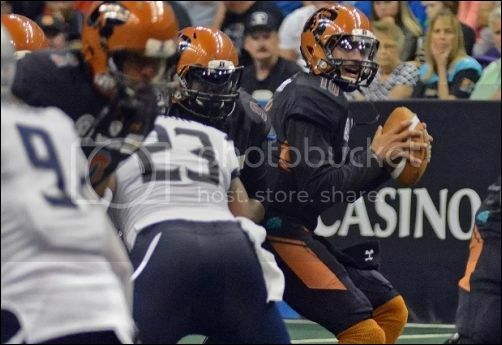 The Steel will start their third quarterback against the Rattlers this season. Danny Southwick was under center to open the season. 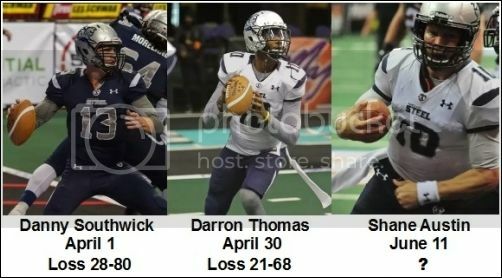 Darron Thomas stepped in as the starter on April 30, and Shane Austin will try to change Portland's fortunes against the Rattlers when he starts in this game. Congratulations to the Steel on their win! Hopefully they can keep it going! It is so great to see a preview already! It seems to me like with Perry back and Jamar Howard coming back that our receiver group is actually getting stronger after we have had so much trouble with injures to our receivers. I can't wait for this game. I think we are going to put up a much better fight against Arizona this time around. This could turn out to be a competitive game. I would love to see the Steel come out of it with a win. I know those are long odds, but we can always hope! The Steel will get the ball first. Touchdown Steel. Tom Gilson 44 yard pass from Shane Austin. Ernesto Lacayo kick. Jamar Howard is indeed back for the Steel. The Steel cannot afford to give up big plays tonight. Touchdown Rattlers. Rod Windsor 2 yard pass from Nick Davila. Alex Zendejas kick. Steel turn it over on downs. Rattlers ball at their own 4. Touchdown Rattlers. Maurice Purify 21 yard pass from Nick Davila. Alex Zendejas kick. Touchdown Steel. Tom Gilson 41 yard pass from Shane Austin. Ernesto Lacayo kick failed.